Searchguide.level3.com is the PUP that uses misleading techniques to prevent removal. Use Reimage to locate malicious components and get rid of them faster than with uninstall instructions. A full system scan blocks virus reappearance and prevents traffic to malicious domains. 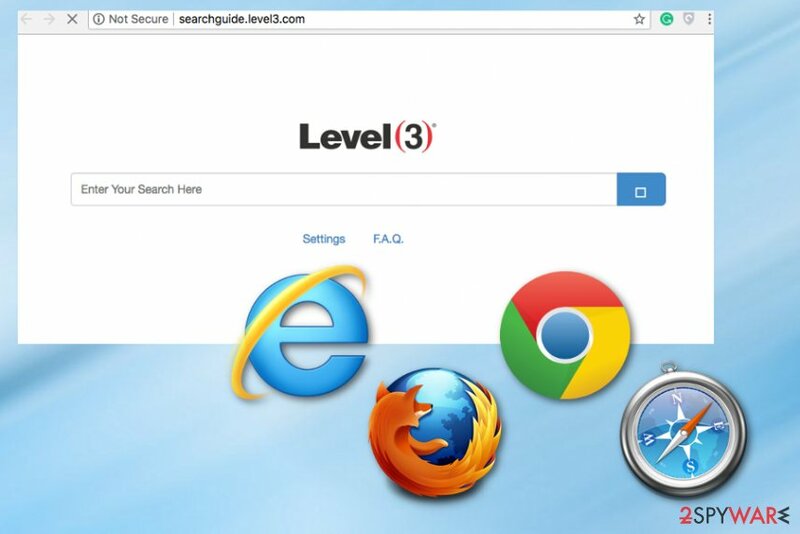 Searchguide.level3.com is a browser hijacker that affects Chrome, Firefox, and other widely used browsers. Searchguide.level3.com is a suspicious online search service that affects the performance of your device and keeps you from accessing certain information. This is an address which the browser hijacker assigns as the default homepage of the infected computer browser. Potentially unwanted programs seek to generate advertising revenue  and often employ pseudo-search engines to be able to deliver sponsored content to the victim’s computer without restrictions. Level3 Search Guide delivers intrusive ads to your Internet Explorer, Mozilla Firefox, Google Chrome and there are more problems finding relevant information and, there is a redirect issue which might result in malware infections. The more you get exposed to commercial content, the higher is the risk of encountering potentially malicious ads or landing on dangerous domains. The worst part is that the hijacker leaves no alternatives and redirects traffic to affiliated sites filled with advertisements promoting questionable products and services while collecting various information about your browsing habits. Searchguide.level3.com browser hijacker usually is not installed by users themselves. Instead, it finds its way to your machine via software bundling – an infamous PUP distribution technique. Freeware and shareware are often bundled together with unwanted programs for more profits and benefits to both parties. Thus, if you found your homepage change our of nowhere – remove Searchguide.level3.com virus from your PC by using our manual guide below or with the help of security software. For best results, use Reimage as well to clean all the mess the unwanted app left on your device. If you must use your browser in order to download and antivirus utility or for other purposes, you should remember a few important things. 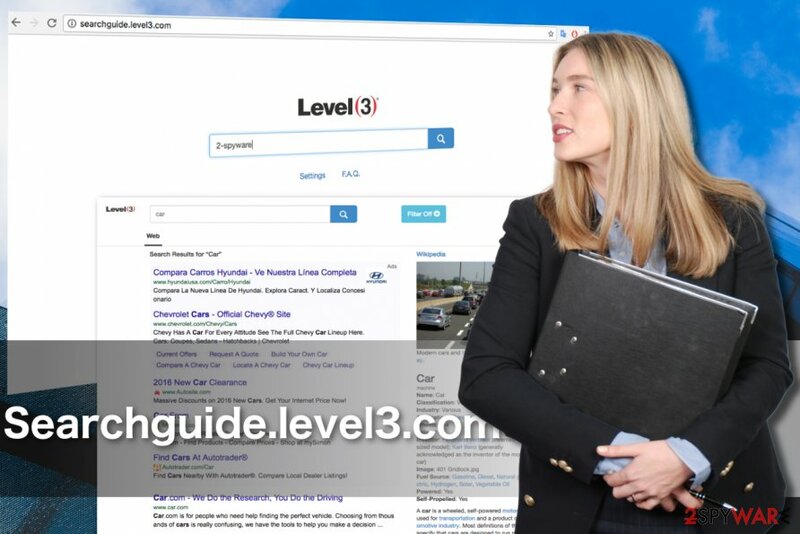 Because Searchguide.level3.com hijack was intended to bring money to the program’s creators, we are confident that they will employ the most advanced techniques to achieve their goal. One of the tactics used by Searchguide.level3.com developers that always proves successful is learning more about the user. Cookies  help collect information about the user’s visited websites, search queries, viewed pages and a bunch of other non-personally identifiable information which can be used to generate more user-specific content. We may disclose, assign, sell, license, or otherwise transfer to a third party, your name, address, e-mail address, member name and any other PII in connection with an assignment, sale, joint venture, or other transfer or disposition of a portion or all of our assets or capital stock. Due to the targeted advertising , the PUP becomes even more dangerous since it delivers ads and links relevant to the user’s interests, consequently making them more appealing and clickable. Do not waste your time tip-toeing through the minefield of ads and take care of Searchguide.level3.com removal. Check the recommendations below to find out more about the virus elimination options. As it is evident from the image above, once the Searchguide.level3.com infects computers, it looks similar to the legitimate search providers. Nevertheless, it does not work like a legitimate search service, thus it's best to remove it from your computer! 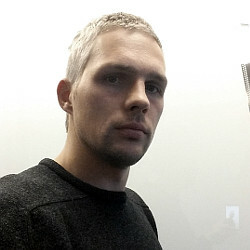 Potentially unwanted programs are not an uncommon guest on the computer, solely because they are lightweight and can easily infiltrate computers undetected. Software packages serve the purpose of sneaking these applications on the system pretty well. PUP developers typically embed the permission to install within installation settings, so the users who pay little attention to the software installation get infected. Nevertheless, this does not mean that this browser hijacker is unstoppable. If you opt for the Advanced settings instead of allowing all the software package components to install automatically during Default or Quick installation, you can easily check-out the undesirable entries and continue installation without anticipating unpleasant surprises. If you’ve realized that this search service does not meet your needs and cause more problems, remove Searchguide.level3.com virus from your computer. If you want to be sure this malware is never coming back to your computer, you will have to employ anti-malware tools and scan your entire system. Such utilities are not only useful in isolated cases such as Searchguide.level3.com removal but also come in handy when it comes to overall system protection. Thus, it is a valuable investment if you don’t already have one installed on your computer. Nevertheless, if you do not wish to make such an investment, you can always try to remove Searchguide.level3.com virus manually. Look for the guidelines on how to do it below the article. Browser hijackers such Searchguide.level3.com are not difficult to remove, even if the elimination is carried out manually. Of course, such elimination asks for a certain level of precision. So, pay extra attention to the instructions provided below before you attempt the elimination. Here, look for Searchguide.level3.com or any other recently installed suspicious programs. Wait until you see Applications folder and look for Searchguide.level3.com or any other suspicious programs on it. Now right click on every of such entries and select Move to Trash. When in the new window, check Delete personal settings and select Reset again to complete Searchguide.level3.com removal. Once these steps are finished, Searchguide.level3.com should be removed from your Microsoft Edge browser. Here, select Searchguide.level3.com and other questionable plugins. Click Remove to delete these entries. Now you will see Reset Firefox to its default state message with Reset Firefox button. Click this button for several times and complete Searchguide.level3.com removal. Here, select Searchguide.level3.com and other malicious plugins and select trash icon to delete these entries. Click Reset to confirm this action and complete Searchguide.level3.com removal. Here, select Extensions and look for Searchguide.level3.com or other suspicious entries. Click on the Uninstall button to get rid each of them. Here, look at the Homepage field. If it was altered by Searchguide.level3.com, remove unwanted link and enter the one that you want to use for your searches. Remember to include the "http://" before typing in the address of the page. Now you will see a detailed dialog window filled with reset options. All of those options are usually checked, but you can specify which of them you want to reset. Click the Reset button to complete Searchguide.level3.com removal process. ^ Browser hijacking explained: how to liberate your browser from malware. Hellotech. Reviews, Tips, and Latest News on Tech Products. ^ Neil Kokemuller. Advertising based revenue model. Chron. Houston News, Sports, Business, and Entertainment. ^ How to redirect a URL. Wikihow. How to do anything. ^ What are cookies?. BBC Webwise. Making the most of being online. ^ Darla Cameron. How targeted advertising works. WashingtonPost. Breaking News, World, US, DC News & Analysis. This entry was posted on 2018-09-18 at 03:14 and is filed under Stealing programs, Viruses. You can quickly scan the QR code with your mobile device and have Searchguide.level3.com virus manual removal instructions right in your pocket. How did you remove Searchguide.level3.com virus?